You can find Santa all over the Seattle area during the holiday season, but there’s only one place around here you can see Santa and his reindeer. 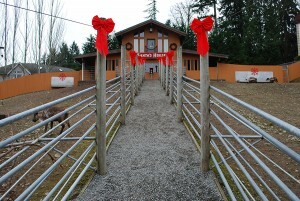 I’m talking about the Issaquah Reindeer Festival at Cougar Mountain Zoo. 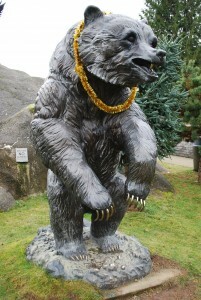 It’s a unique setting for holiday fun in the Pacific Northwest. Every December, Cougar Mountain Zoo (19525 S.E. 54th St.) transforms into a winter wonderland for the Issaquah Reindeer Festival. While the zoo is usually only open Wednesday-Sunday, that’s not the case during the holiday season. The event happens daily during December (except for Christmas Eve, Christmas Day, and New Year’s Eve). From December 1st to December 23rd the zoo is open from 10am-4:30pm, but the hours shift to 11am-3pm for December 26th-December 30th. From the Christmas music that greets you in the parking lot to the workers dressed in holiday garb, everyone and everything is decked in the holiday spirit for the Issaquah Reindeer Festival at Cougar Mountain Zoo. The highlight of the event is obviously Santa and his nine reindeer. 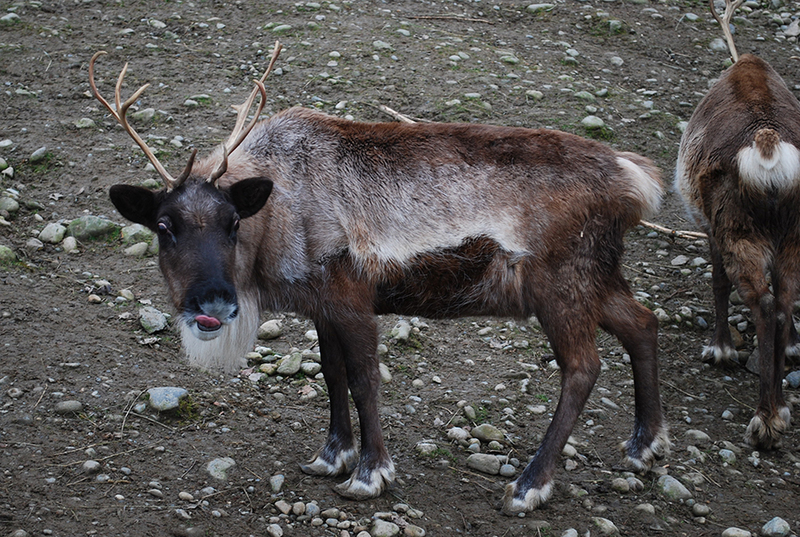 As you stroll up the walkway toward Santa’s house, you meet the reindeer along the way. 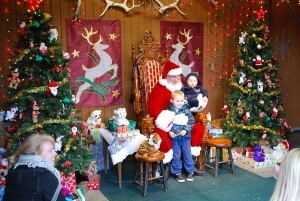 Once you’re into Santa’s house, take a seat (or set your kids) on the big guy’s lap for pictures. You can take your own photos or purchase the one snapped by the zoo staff (I think it costs $5). Be sure to carry a couple extra bucks in your pocket, because you can buy paper cups filled with diced apples that you can actually feed the reindeer. That was easily my favorite part of the entire event (because I’m a 6-year-old trapped in an adult’s body)! Don’t miss Santa’s Post Office at the Issaquah Reindeer Festival. That’s where kids can draw pictures and write letters to Santa. There is also free face painting everyday from 12pm-2pm, story time with Santa’s elf, and plenty of photo opportunities on Santa’s training and/or traveling sleighs. 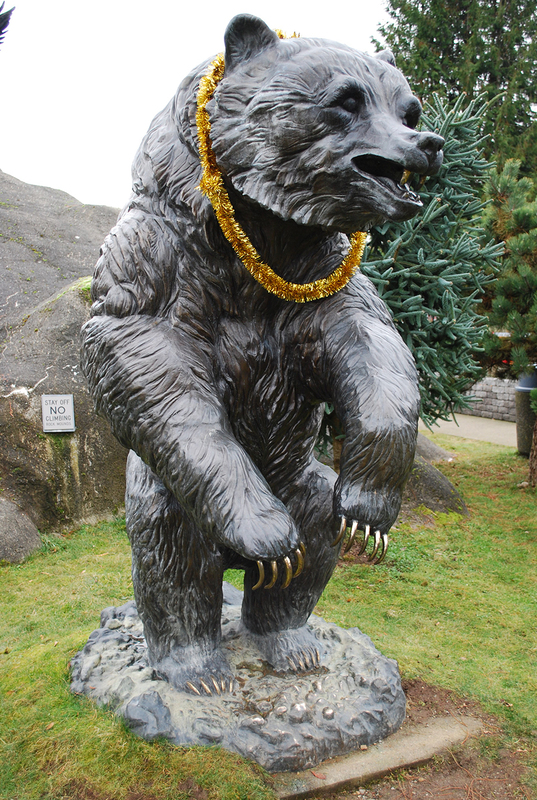 Not to mention, all of the zoo’s animal statues are dressed in festive tinsel decorations. There are also Santa’s kittens, candy cane makers — the list of activities goes on and on. There’s honestly something fun for everyone at the Issaquah Reindeer Festival. 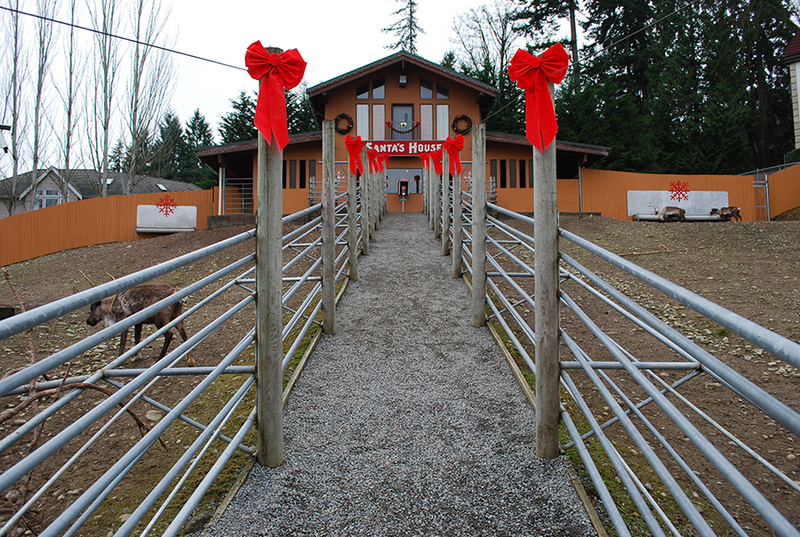 On top of all the holiday fun, Cougar Mountain Zoo is on full display during the Issaquah Reindeer Festival. That means you can still get an up-close look at the zoo’s other amazing creatures, like cougars, tigers, lemurs, wallabies and much more. The only animals not out for viewing during the Issaquah Reindeer Festival are the tropical birds (because it’s way too cold for them). Just like the reindeer, you can feed other animals at the zoo too (it costs $.50 for a handful of food), including deer, alpacas and emus. The Issaquah Reindeer Festival at Cougar Mountain Zoo comes at a cost. It’s $14.50 for adults (13-61), $12.50 for seniors (62+), $10.50 for children 2-12, and kids 2-and-under are free. If you bring a new, unwrapped present for the holiday toy drive, you’ll receive one free children’s admission to the zoo — for your next trip in January through March. If you’re looking for out-of-the-ordinary holiday fun, the Issaquah Reindeer Festival is the perfect location. Not only do you get to enjoy Christmas festivities, but you also get to stroll through the zoo at the same time. You’re surrounded by the holiday spirit the second you step out of your car until you hop back in your ride to drive home. I saw older couples without kids getting their faces painted and checking out the animals, but I also saw tons of families with children romping around. There’s no doubt the Issaquah Reindeer Festival is great for all ages! 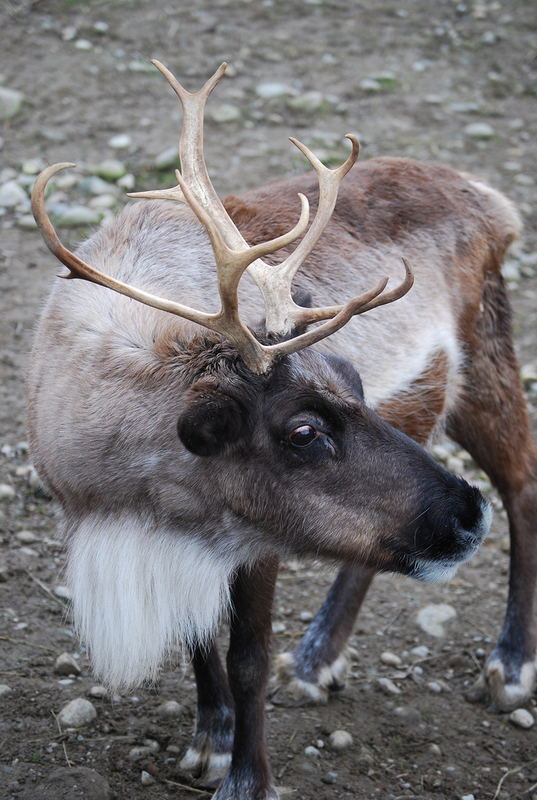 Have you ever gone to the Issaquah Reindeer Festival at Cougar Mountain Zoo? How was your experience? We’d love to hear from you! Please leave a comment below or connect with us on Twitter, Facebook, and Google+. 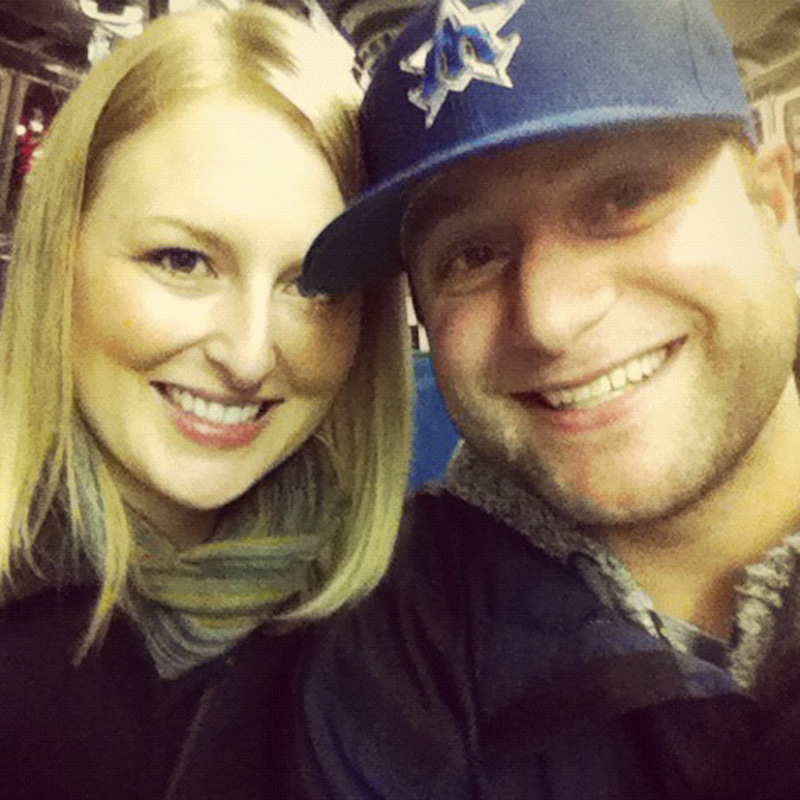 Don’t forget to also visit Seattle Bloggers for more holiday ideas around the Emerald City.